Dinosaurs had a great run, don't get me wrong. 175 million years, humans would be lucky to get anywhere close to that number. Still, I can't help but think, if dinosaurs were connected to the Cloud and had the processing power of IBM Watson, maybe they would have known about the asteroid and hatched a plan to live for another 65 million years. That would have been awesome, because then real dinosaurs would be around today and could tell us what they think of the new CogniToys Dino ($99) cloud connected educational toy. What Do You Do With a Cloud Connected Dinosaur? The question should be, what don't you do with a cloud connected dino? Play games, have dino tell you stories, jokes, fun facts and even carry on personalized conversations. Educational: Includes stories, games, jokes, and fun facts, which encompass subjects including vocabulary, math, geography, science, and more to engage your child in educational play based on their academic needs. Constantly Evolving: Cloud-connected, Wi-Fi-enabled smart toys, allowing for the play experience to constantly improve and update automatically as new content becomes available. Smart: Engage kids with a wide variety of content by encouraging learning and play using interactive dialogue. Through IBM Watson and Elemental Path's Friendgine technology, the dynamic Dinos are truly putting the "smart" in smart toy. 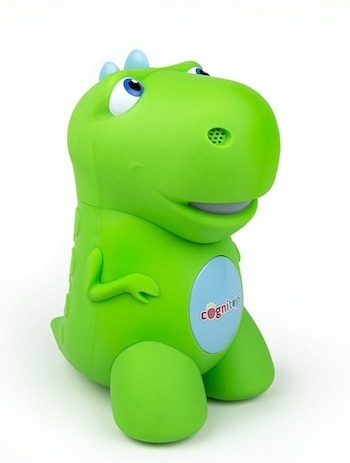 Personalized: The CogniToys Dino grows with children by listening to their questions and in turn, adapting to their personal preferences and unique educational skill set. The toy explores favorite colors, animals and more to customize engagement as well. CogniToys Dino is still a little rough around the edges. Sometimes the response takes too long. Other times, the Dino just keeps going with some activity and the kids can't figure out how to stop her. There are definitely some growing pains with this brand new type of toy. Overall, the CogniToys Dino does an amazing job of engaging kids and carrying on a conversation with them. Press the Dino's belly, say tell me a story and the good times begin. CogniToys Dino is not perfect, but neither were real dinosaurs...otherwise they would not be extinct.